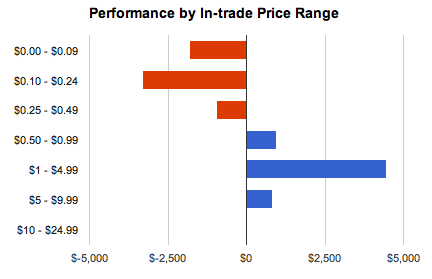 Tradervue now calculates MFE and MAE statistics for your trades! This has been a very popular request, and we’re happy to have it in for you now. Position MFE – the maximum interim profit during the trade. Usually referred to as Maximum Favorable Excursion, and sometimes referred to as runup. Position MAE – the maximum interim loss during the trade. Usually referred to as Maximum Adverse Excursion, and sometimes referred to as drawdown. Price MFE – the maximum favorable price movement during the trade, independent of position size. Price MAE – the maximum adverse price movement, independent of position size. This shows your trading performance (or frequency) by how much of a price swing the trade experienced while you were in the trade. Average position MFE/MAE is also available on the Detailed report stats, and also on the win vs. loss and compare report tabs. These new statistics and reports are available now for all silver and gold subscribers! Tradervue now supports importing trades from TradeMonster! To import your trades, go to the Tradervue Import page, and select TradeMonster from the list. As always, if your broker/platform is not on our list of supported brokers and platforms, let us know. We have added support for importing trades from SureTrader. This will most likely work for other brokers that use iBoss as well! When Tradervue first introduced tags, one of the common use cases was to use tags for separating multiple trading accounts. You could tag trades on import, and identify them with the specific account they came from. The reason for this is when importing new trades, Tradervue will look to see if there is already an open position in that symbol, and if so, it will apply new executions from your import to those positions. This is almost always what you want, except in the situations above. To address this, we have added Account Tags. These are just regular tags, but when applied at import time, they have a special effect on the import. If you tag each of your imports with an account name of some sort, then trades from each account will be kept completely separate. Stay consistent – if you decide to use account tags to segregate your trades between multiple accounts, then use them every time. UPDATE 5/5/2016: you can now check the “Require account tag for every import” box to ensure you don’t forget to use an account tag; more details here. If you’re using account tags, take a moment to read the help page about them; having an understanding of how they affect the import will allow you to use them in many situations to control the way trades are imported. Account Tags are available for use today for all silver and gold users; and normal tags are of course still available for everyone. We’ve added options support for TradeStation users. As always, please let us know if your broker/platform isn’t on the supported list and we’ll try to get it added! Tradervue now supports importing trade data from OptionsXpress! To import your trading data, just go to the Tradervue import page, choose OptionsXpress, and follow the instructions. As always, if you don’t see your broker or platform on our supported list, or we don’t yet have the specific feature supported that you need, please let us know!